As America’s oldest and boldest gun violence prevention group, Brady’s history of success goes back decades. In 1974, Dr. Mark Borinsky founded the National Council to Control Handguns after being robbed and nearly murdered at gunpoint. The organization evolved in 1980 when it became Handgun Control, Inc. (HCI). It was just one year later when HCI’s and the country’s future changed forever. Jim “the Bear” Brady had achieved a lifelong dream when he was named White House Press Secretary under President Ronald Reagan. However, his service was cut short on March 30, 1981, during an assassination attempt against the president. In addition to President Reagan, Jim and two law enforcement officers were shot. Jim suffered a serious head wound that left him partially paralyzed for life. Although Jim never returned to his position after the shooting, he kept the title for the remainder of President Reagan's presidency. Soon after the shooting, Jim’s wife Sarah Brady, a respected political operative in her own right, began working with HCI. She was elected to the board in 1985, and became the Chair of the organization in 1989. Two years later, she became the Chair of HCI’s sister organization, the Center to Prevent Handgun Violence. At HCI, Sarah and Jim led the fight to pass federal legislation requiring background checks for all gun sales. Sarah and Jim spent years navigating the halls of Congress, meeting with legislators across party lines to generate enough votes to pass the “Brady Bill,” a law they knew would save lives. The original Brady legislation was introduced in 1988. It took six votes over seven years and three presidencies until Sarah, Jim, and their team were able to declare victory. On November 30, 1993, after Sarah and Jim’s seven-year battle, President Bill Clinton signed the Brady Bill into law. Brady Background Checks would now be required on all handgun purchases from federally licensed firearm dealers. The signing of the Brady Bill was only the beginning. Sarah continued to advocate for common-sense gun laws at the state and federal level throughout the rest of her life. In 1994, Sarah and Jim received the S. Roger Horchow Award for Greatest Public Service by a Private Citizen, an award given out annually by Jefferson Awards. In 1996, she and Jim received the Margaret Chase Smith Award presented by the Secretaries of State. In 1996, Jim received the Presidential Medal of Freedom from President Clinton, the highest civilian award in the United States. On February 11, 2000, President Clinton officially named the White House Press Briefing Room “The James S. Brady Press Briefing Room” in Jim’s honor. A plaque honoring Jim for his service as White House Press Secretary now hangs in that room. 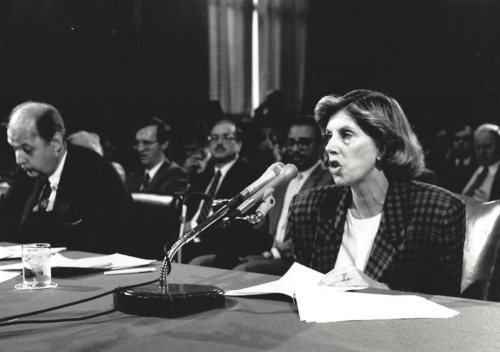 In December 2000, the Boards of Trustees for Handgun Control and the Center to Prevent Handgun Violence voted to honor Jim and Sarah Brady’s hard work and commitment to gun control by renaming the two organizations the Brady Campaign to Prevent Gun Violence and The Brady Center to Prevent Gun Violence. That same year, the Brady Campaign and Center joined with the Million Mom March to expand their efforts to communities throughout the country. Jim and Sarah both continued their commitment to preventing gun violence for the remainder of their lives, with Sarah serving as the Chair of both organizations until 2015. Jim Brady passed away on August 4, 2014 at the age of 73. His death was ruled a homicide, caused by the shooting 33 years earlier. Sarah passed away one year later, on April 3, 2015 at the age of 73. Today, Brady continues to uphold Jim and Sarah’s legacy by uniting Americans from coast to coast, red and blue and every color, to combat the epidemic of gun violence. In Congress, in the courts, and in communities across the country, Brady can be counted on to be there for all victims of gun violence, leading the fight for a safer country for all of us. Brady has always been more than a name, it’s a passion for change.